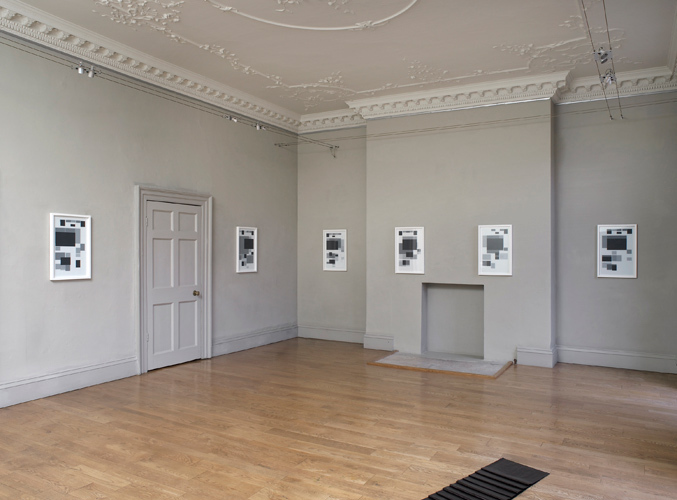 James Brooks' practice uses radio, film, television and paper–based media sources of varying cultural status, as starting points to make works within drawing, print, audio and video. The diverse elements of this practice come together with a strong conceptual unity. Much of Brooks' work is concerned with notions of information exchange. With a nod to relational aesthetics he describes his interest in the ways that information is mediated and received, and the role of an audience within this process. And yet there is an implied critique of some of the mechanics of this exchange. The title of the exhibition references an early manual telephone exchange and this metaphor provides an important key to interpreting the work. At times we might conclude that Brooks' sees the artist's role as being a conduit for the viewer experience, akin to the role of the telephone operator. At other times, he appears to identify with the viewer, or with the person placing or receiving the call. The audio work 'Half Ours' investigates an audience's participation within a work of art. It consists of a 30 minute episode of Hancock's Half Hour, in which Brooks has edited out the specific narrative content so that all that remains is the audience's participatory laughter. It is unclear whether the laughter is genuine, or whether it is controlled canned laughter inserted in post–production to maintain the momentum of the episode. Within the gallery, the staccato punctuations of the laughter become surprisingly unsettling, producing a counterpoint to the rest of the work that unsettles any prior reading of it. In works such as 'Global Editions' 'Strip Biographies' 'Spaces of Cerebral Exchange' among others, Brooks examines how the utopian beliefs and aspirations of modernism are challenged, altered or subsumed by our present information age. this critique of modernism is implied in a series of allegories that adopt the language of late modernism. The work also recognises the futility in replacing one set of utopian beliefs with another, and questions the limits of the present information age, in particular our ability to access and transfer information freely. In 'Letter from the House of Commons', Brooks utilizes a letter received from his MP in response to his request for clarification of current copyright and authorship law. He has translated the text into standardized computer code and then laboriously reproduced the converted code by hand, strictly adhering to the layout of the original reply letter. Brooks' intervention reveals the thin veneer of personalised concern contained within the letter, and the authenticity of the communication is called into question. The Information Exchange invites us to reconsider the channels through which we give and receive information, and the extent to which this determines our situation. We are left questioning the extent to which Brooks is controlling our viewing experience, and whereabouts he is located within this exchange. James Brooks completed his MA in Fine Art at Chelsea College of Art in 2004 and since then has exhibited widely, both in the UK and internationally. Galleries include Tate Britain, Seventeen, Arcade and Riflemaker in London, Galerie Thaddaeus Ropac, Paris, Trinity Contemporary London and New York, Bomuldsfabriken Kunsthall, Norway, Galerie Laurent Mueller, Paris and Spike Island, Bristol, UK. Solo exhibitions include 126 Gallery, Ireland and Galerie Martina Detterer, Frankfurt (both 2011), Trinity Contemporary, London (2010) and Monika Bobinska Gallery, London (2008). Forthcoming in 2013 is a solo show at Platform A Middlesbrough. Brooks curated the Arts Council–funded Drawing exhibition 'Until it makes Sense' (2006) and wrote on contemporary drawing for the publication/ symposium 'Drawing: The Future' held at The National Gallery, London and in 2007 he was selected for the Contemporary Art Society's Art Futures held at Bloomberg Space. His work is held in collections including the University of Arts London, Thaddaeus Ropac, The Gottesman Collection, David Roberts Arts Foundation and the Städel Museum Graphic Collection, Frankfurt, Germany. Recent publications include 'Eleven Times James Brooks' (2010) Trinity Projects, 'Folks' (2011) published by Galerie Laurent Mueller, 'Artists' Postcards: A Compendium' (2012) by Jeremy Cooper, published by Reaktion Books. This exhibition is presented jointly by Domo Baal and Lucy Newman Cleeve of Man&Eve Gallery, London.